Looking for some high end promotional gifts? Take a look at what renowned brands are doing in the market! Swarovski is currently holding a gift with purchase promo at Hellenic Duty Free Shops in Greece. Purchase EUR120 worth of Swarovski products and receive this promotional jewelry container for free! Associating colours and ensuring that it suits your product is very important. Swarovski has presented a classy and professional looking high end promotional item. Detailed thread line displays precise craftsmanship of the product. Customization on the interior such as having different jewellery compartments adds function. 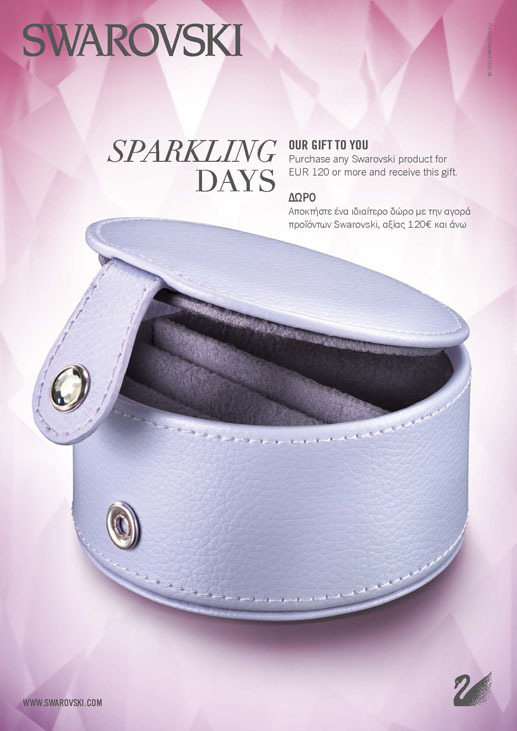 Well known for its crystals, including one on the button is a nice way to add value and reminds customers of their core speciality through this promotional gift. Sewing or printing their brand on outside would be another option but this brand choose to keep it simple. See below for more high end promotional product ideas!